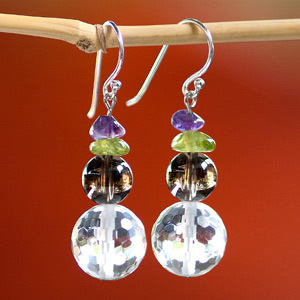 Rock crystal, smoky quartz, peridot and amethyst form a feminine pair of earrings. 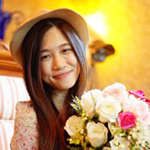 Working by hand Phat Tangmo hangs the design from sterling silver hooks. 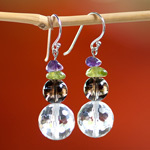 Materials: Rock Crystal, smoky quartz, peridot, amethyst and sterling silver (.925).